međusobnog odnosa između aktivnosti Saveta Evrope i nacionalnih antikultnih strategija. U završnom odeljku su istaknute primećene tendencije i pravilnosti, paralelno sa generalnim sumiranjem postignutih uvida. Između ostalog, uočeno je da je Savet zauzeo veoma obazriv, liberalan i tolerantan stav u odnosu na materiju novih religijskih pokreta. Preporučujući državama članicama isključivo proučavanje navedene problematike i edukaciju stanovništva, Savet je jasno sugerisao izbegavanje legislativnih i drugih invazivnih antikultnih mera. Otuda se potencijalni uticaj preporuka Saveta može tražiti isključivo u okviru onih država koje zastupaju istovrstan, liberalan i neinvazivan pristup. Nasuprot tome, takav uticaj Saveta nije opravdano povezivati sa politikom onih zemalja koje su se, protivno preporukama 1178 i 1412, opredelile za radikalnije (zakonodavne i druge) korake. Sa druge strane, čini se osnovanim pretpostaviti da su, upravo suprotno, države sa antikultnim zakonodavstvom i drugim invazivnim antikultnim merama lako mogle uticati na svojevrsnu radikalizaciju stanovišta Saveta Evrope, koja se može primetiti u okviru najnovijih, no zvanično neusvojenih dokumenata Saveta: Dokumenta 12595 i Izveštaja 13441. Bellanger, F, Richardson, J,Legal Cases, New Religious Movements and Minority Faiths, Ashgate Publishing, Farnham 2014. Božović, R,„Sekte, kultovi i tolerancija prema njima”,Teme, 27(1)/2003, 119-131. Bromley, D, „Satanism: The new cult scare“, in: The Satanism Scare (eds. James Richardson, Joel Best, David Bromley), Aldine De Gruyte, Hawthorne 1991, 49-72. Đorđević, D, Proroci “nove istine”: sekte i kultovi (šta treba da znamo o novim religioznim pokretima? ), JUNIR: Društvo za zaštitu i unapređenje mentalnog zdravlja dece i omladine, Niš 1998. Đorđević, D, „Antikultni pokret- mogući izraz religiozne netolerancije“, Facta universitatis- series: Philosophy and Sociology, 6(2)/1999, 257-270. Frankfurter, D,Evil Incarnate: Rumors of Demonic Conspiracy and Ritual Abuse in History, Princeton University Press, Princeton 2006. Goldman, M, „Review Essay: Cults, New Religions, and the Spiritual Landscape: A Review of Four Collections“, Journal of the Scientific Study of Religion, 45(1)/2006, 87–96. Jenkins, P, Maier-Katkin, D, „Satanism: Myth and Reality in a Contemporary Moral Panic”, Crime, Law and Social Change, 1/1992, 53-75. Jenkins, P, „Satanism and Ritual Abuse”, in: The Oxford Handbook of New Religious Movements (ed. James Lewis), Oxford University Press, New York 2004, 221-242. Kaplan, J, Lööw, H, The Cultic Milieu: Oppositional Subcultures in an Age of Globalization, AltaMira Press, Walnut Creek 2002. Karlsberg, E, „Satanism Threatens Youth”, in: Satanism (ed. Tamara Roleﬀ), Greenhaven Press, San Diego 2002, 9-13. Lewis, J, Petersen, J, Controversial New Religions, Oxford University Press, Oxford 2005. Matković, A, Krivično-pravni aspekti okultnih ritualnih aktivnosti, doktorska disertacija, Pravni fakultet Univerziteta Union u Beogradu, Beograd 2016a. 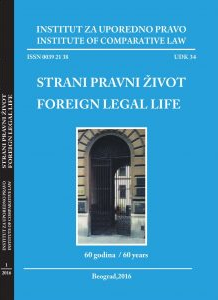 Matković, A, „Antikultna legislativa u Sjedinjenim Američkim Državama“, Pravni zapisi, 1/2016b, 134-152. Matković, A, „Francuski zakon br. 2001-504 od 12. juna 2001. kao izvor verske diskriminacije i društvene destabilizacije“, Glasnik Advokatske komore Vojvodine, 5/2016, 199-215. Matković, A, „Krivična dela povezana sa okultizmom - pojam, pasivni subjekti i objekti radnje izvršenja“, Crimen, 2/2016, 207-222. Mazza, M, „Anti-Satanism is Bigotry“, in: Satanism (ed. Tamara Roleﬀ), Greenhaven Press, San Diego 2002, 29-32. Murdok, Dž, Sloboda misli, savesti i veroispovesti: vodič za primenu člana 9 Evropske konvencije o ljudskim pravima, Savet Evrope, Beograd, 2008. Nathan, D, „Satanism and Child Molestation: Constructing the Ritual Abuse Scare“, in: The Satanism Scare (eds. James Richardson, Joel Best, David Bromley), Aldine De Gruyte, Hawthorne 1991, 75-94. Nathan, D, Snedeker, M, Satan’s Silence: Ritual Abuse and the Making of a Modern American Witch Hunt (second edition), Authors Choice Press, Linkoln 2001. Noblitt, J, Perskin, P, Cult and Ritual Abuse – It’s History, Anthropology and Recent Discovery in Contemporary America (second edition), Greenwood Publishing Group, Santa Barbara 2000. Ogloﬀ, J, Pfeifer, J, „Cults and the law: A discussion of the legality of alleged cult activities“, Behavioral Sciences & the Law, 1/1992, 117–140. Oliver, S, „Claims of Satanic Ritual Abuse are Unsubstantiated“, in: Satanism (ed. Tamara Roleﬀ), Greenhaven Press, San Diego 2002, 49-67. Reichert, J, Richardson, J, „Decline of Moral Panic: A Social Psychological and Socio-Legal Examination of the Current Status of Satanism”, Nova Religio: The Journal of Alternative and Emergent Religions, 2/2012, 47-63. Richardson, Ј, Best, Ј, Bromley, D, „Satanism as a Social Problem“, in: The Satanism Scare (eds. James Richardson, Joel Best, David Bromley), Aldine De Gruyte, Hawthorne 1991, 3-17. Richardson, J, „Legal Dimensions of New Religions“, in: The Oxford Handbook of New Religious Movements (ed. James Lewis), Oxford University Press, New York 2004, 163-184. Robbins, S, „Social and Cultural Forces Were Partially Responsible for Satanic Panic”, in: Satanism (ed. Tamara Roleﬀ), Greenhaven Press, San Diego 2002, 91-103. Robinson, B, „Ritual Abuse Legislation passed by U.S. state legislatures”, Religious Tolerance, 2001, http://www.religioustolerance.org/ra_law.htm, 27.11.2012. Robinson, B, „France: Attack on New Religious Movements“, Religious Tolerance, 2004, http://www.religioustolerance.org/rt_franc1.htm 28.12.2012. Robinson, B, „Ritual Abuse (RA)“, Religious Tolerance, 2007, http://www.religioustolerance.org/ra.htm, 19.12.2012. Robinson, B, „Satanic Ritual Abuse (SRA)“, Religious Tolerance, 2010, http://www.religioustolerance.org/sra.htm, 19.12.2012. Sutcliﬀe, S, „New Age, world religions and elementary forms“, in: New Age Spirituality: Rethinking Religion, second edition (eds. Steven Sutcliﬀe, Ingvild Saelid Gilhus), Routledge, London 2014, 17-34. Tompson, K, Moralna panika, Clio, Beograd 2003. Victor, J, Satanic Panic: The Creation Of A Contemporary Legend, Open Court Press, Chicago 1993. Victor, J, „The Extent of Satanic Crime is Exaggerated” in: Satanism (ed. Tamara Roleﬀ), Greenhaven Press, San Diego 2002, 32-49. York, M, The Emerging Network: A Sociology of the New Age and Neo-pagan Movements, Rowman & Littlefeld Publishers, Inc, Lanham 1995. Young, M. de, „One Face of the Devil: The Satanic Ritual Abuse Moral Crusade and the Law“, Behavioral Sciences and the Law, 4/1994, 389-407. Loi du 2 juin 1998/ Belgique, http://www.ejustice.just.fgov.be/cgi_loi/change_lg.pl?language=fr&la=F&table_name=loi&cn=1998060257, 27.01.2016. Loi n°2001-504 du 12 juin 2001, http://www.legifrance.gouv.fr/afchTexte.do?cidTexte=JORFTEXT000000589924&dateTexte=&categorieLien=id, 26.01.2018. Loi du 21. février 2013. portant incrimination de l’abus de faiblesse, http://www.legilux.public.lu/leg/a/archives/2013/0035/a035.pdf, 25.01.2018. Loi du 21. février 2013. relative à la lutte contre les abus sexuels et l’exploitation sexuelle des enfants et portant modifcation de plusieurs dispositions du Code penal, http://www.legilux.public.lu/leg/a/archives/2013/0035/a035.pdf, 25.01.2018. CoE, Recommendation 1178 (1992), Sects and new religious movements, adopted on 05.02.1992. by the Parliamentary Assembly/ 23th Sitting, http://assembly.coe.int/nw/xml/XRef/Xref-XML2HTML-en.asp?fileid=15212〈=en, 02.03.2018. CoE, Recommendation 1412 (1999), Illegal activities of sects, adopted on 22.06.1999. by the Parliamentary Assembly/ 18th Sitting, http://assembly.coe.int/nw/xml/XRef/Xref-XML2HTML-en.asp?fleid=16713〈=en, 02.03.2018. CoE, Doc. 9612 (2002), Freedom of religion and religious minorities in Francereport, 31.10.2002, http://www.assembly.coe.int/nw/xml/XRef/X2H-XrefViewHTML.asp?FileID=9915〈=EN, 26.01.2018. CoE, Doc. 12595 (2011), The protection of minors against sectarian inﬂuencemotion for a resolution, 18. 04. 2011, http://www.assembly.coe.int/nw/xml/XRef/X2H-Xref-ViewHTML.asp?FileID=12674〈=en, 02.03.2018. CoE, Doc. 13441 (2014), The protection of minors against excesses of sects report, 17. 03. 2014. http://www.assembly.coe.int/nw/xml/XRef/Xref-XML2HTML-en.asp?fleid=20544〈=en, 02.03.2018. Rapport n° 2468 au nom de la commission d’enquête sur les sectes, Enregistré à la Présidence de l’Assemblée nationale le 22 décembre 1995, http://www.assemblee-nationale.fr/rap-enq/r2468.asp, 04.03.2018. Rapport n° 1687 au nom de la commission d’enquête sur la situation financiere, patrimoniale et fscale des sectes, ainsi que sur leurs activites economiques et leurs relations avec les milieu economiques et fnanciers, Enregistré à la Présidence de l’Assemblée nationale le 10 juin 1999, http://www.assemblee-nationale.fr/dossiers/sectes/sommaire.asp, 04.03.2018. Rapport n° 3507 au nom de la commission d’enquête relative à l’inﬂuence des mouvements à caractère sectaire et aux conséquences de leurs pratiques sur la santé physique et mentale des mineurs, Enregistré à la Présidence de l’Assemblée nationale le 12 décembre 2006, http://www.assemblee-nationale.fr/12/rap-enq/r3507.asp, 04.03.2018.